The IFMG offers technological courses at basic and higher leves. 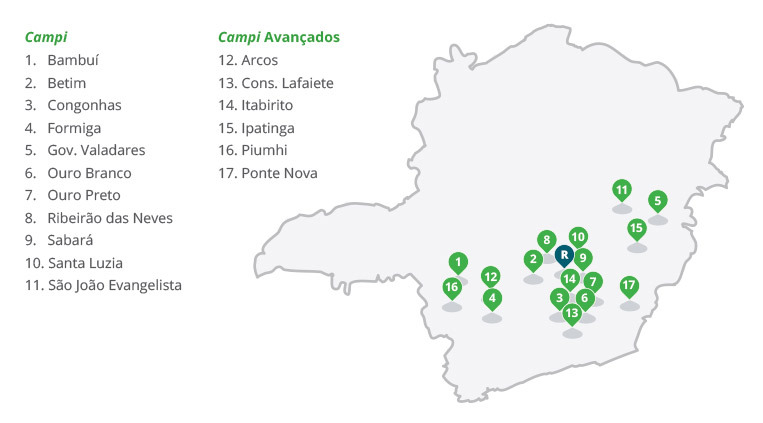 The Administrative unit is located in Belo Horizonte – the capital of Minas Gerais and 17 campi in other cities. Mission: We aim to give Professional and Technical Education, through Teaching, Research and Extension, promoting development in the context of an inclusive and democratic society. Vision: We aim to be an institution of excellence in professional and technological education, boosting technological, scientific, humanistic, environmental, social and cultural development, aligned with the region characteristics in which it appears. The IFMG offers a master program – Professional Master in Sustenability and Environmental Technologies.